A Virginia State trooper who was shot while executing a search warrant has died. Trooper Lucas Dowell’s was assisting the Piedmont Regional Drug and Gang Task Force with executing a search warrant yesterday evening in Farmville. Dowell died in the hospital. No other troopers were injured in the shooting. The man who fired at officers was also shot and killed, according to the release. Dowell would normally patrol areas including the City of Lynchburg, as well as Amherst and Campbell counties. Full News Release From Virginia State Police: The Virginia State Police Bureau of Criminal Investigation’s Appomattox Field Office is investigating a shooting in Cumberland County that claimed the life of a Virginia State Police trooper and resulted in the death of the shooting suspect. The incident occurred Monday, Feb. 4, 2019.Trooper Lucas B. Dowell was a member of the Virginia State Police Tactical Team that was assisting the Piedmont Regional Drug and Gang Task Force with executing a search warrant at a residence in the 1500 block of Cumberland Road/Route 45, just north of the town limits of Farmville. The Tactical Team had made entry into the residence shortly before 10 p.m. Monday when an adult male inside the residence began shooting at them. The Tactical Team members returned fire, fatally wounding the male suspect.Trooper Dowell was transported to Southside Community Hospital in Farmville where he succumbed to his injuries. 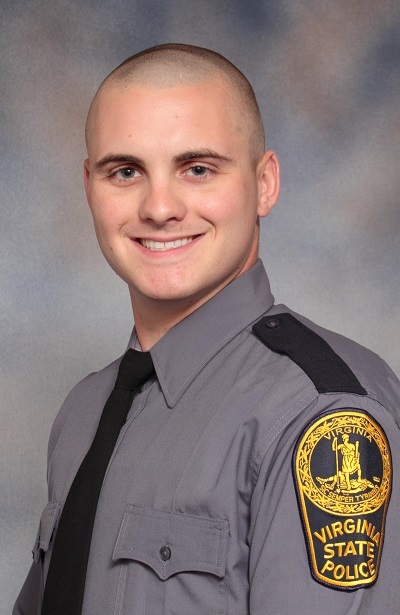 Trooper Dowell becomes the Department’s 66th line of duty death. The Chilhowie, Va. native graduated the Virginia State Police’s 122nd Basic Session in November 2014. Since graduation he has been assigned to the Virginia State Police Appomattox Division; his latest assignment was on patrol in Area 20, which encompasses the City of Lynchburg, and Amherst and Campbell counties. He was a member of the Appomattox Division Tactical Team – the equivalent of a SWAT Team. He is survived by his parents and a sister.“This is an extremely difficult day for the State Police,” said Colonel Gary T. Settle, Virginia State Police Superintendent. “We are humbled by Lucas’ selfless sacrifice and grateful for his dedicated service to the Commonwealth. He will forever be remembered by his State Police Family for his great strength of character, tenacity, valor, loyalty and sense of humor.”The adult male suspect died at the scene. His remains were transported to the Office of the Chief Medical Examiner in Richmond for examination and autopsy. State police are still in the process of notifying next of kin. The male suspect was the only individual inside the residence at the time of the shooting. The search warrant was being conducted as part of an ongoing narcotics investigation.No other troopers were injured in the shooting. In accordance with Virginia State Police policy, the two troopers who fired their weapons have been placed on administrative leave.